Machikogareteta yoru ni Come on, hurry! SANTA mo tenshi mo Laughin'!! Chijou no junbi "Oki Doki"
Jirasazu orite kite yo Come on, hurry! Min'na de sawageba So much fun! Cheers, to you! Cheers, to me! 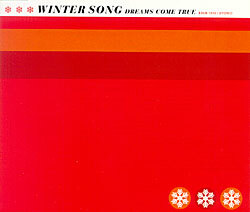 Epic/Sony’s re-release of Winter Song after DCT left them to sign with Virgin. One of only two places to find the original Japanese version of Winter Song, Yuki no Christmas.